Today we're sharing a favorite recipe in our house. 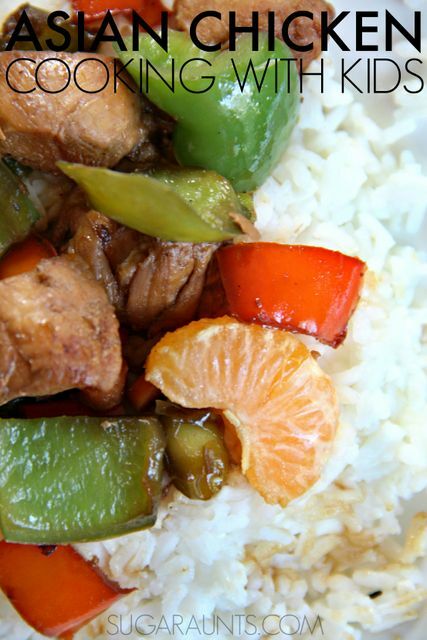 This Asian Chicken is easy to throw together and always a hit with the kids. 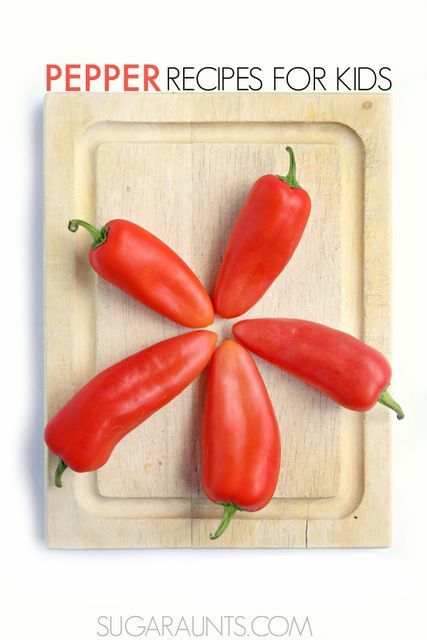 This week in our Cooking With Kids A-Z series, we're sharing P for Peppers. This chicken dish is full of red and green peppers and perfect for filling your family with vegetables! 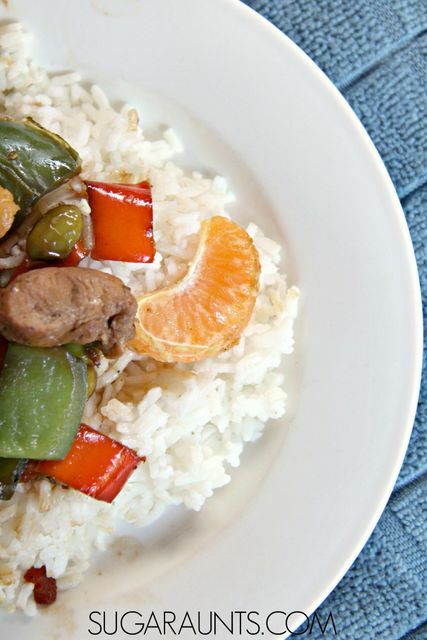 Cooking with kids is such a fun learning experience and this recipe is no exception. Chopping, stirring, dicing, and cooking makes this family dinner recipe a great way to learn with your dinner. Rice, enough to feed your family (We make servings for 6). There are a lot of steps in this recipe, but they are not complicated, and only provide a complex direction following task set for your kids as they cook alongside you. You can break down the steps of this recipe into one-two step parts to reduce the complexity for younger children. To begin, warm the olive oil in a saute pan. Add the chopped garlic and brown slightly by stirring. Add the chicken and cook on all sides. Meanwhile, cut the peppers. To make chopping red and green peppers easier for smaller kids, you can first slice the peppers into strips, Julienne style. 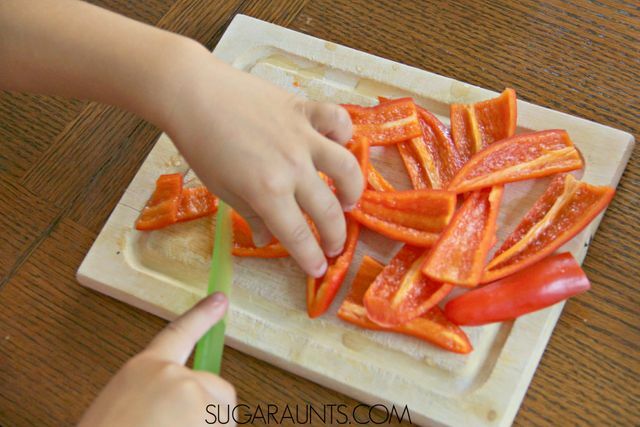 Kids can then easily chop the peppers using a Safety knife. Have them chop the red and green peppers into large pieces. Cook the edamame. To cook, bring a pot of water to a boil. Add the edamame and cook for a few minutes. Drain the beans and cool them by rinsing. Shell the beans by squeezing the pods. 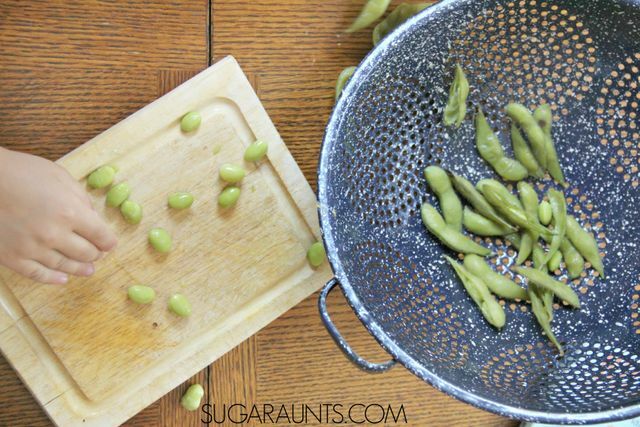 Kids love to pop open edamame shells and separate the beans. Set aside. Peel and separate the Mandarin oranges. Set aside. Peel and dice the Carrots. I love this Kid-friendly safety vegetable peeler . Cook the rice. Set aside. Once the chicken has browned, add the soy sauce and honey. Stir to coat the chicken and add the red and green peppers, and edamame. Cook covered for 10 minutes, stirring often. 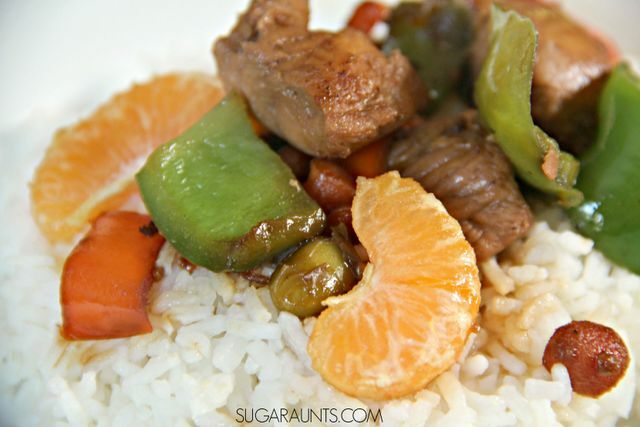 Remove the lid and add the mandarin oranges. Cook and stir for 2-3 minutes more. Remove from heat and serve over rice. Follow Sugar Aunts's board Cooking with Kids on Pinterest. Want to cook healthy foods for your family? Grab Yum! 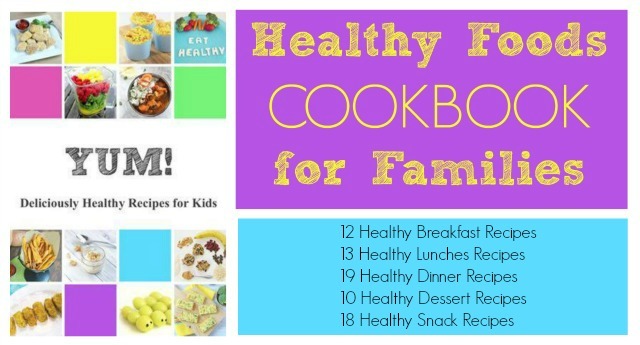 Deliciously Healthy Meals for Kids, a cookbook for busy families that want healthy meal ideas.